With the 2011 presidential elections drawing near, the players within the office of the presidency have begun to find their respective levels. As Ukpakareports.com has gathered through impeccable sources in the office of the presidency, President Yar'Adua have begun courting the “Obasanjo boys” to assist in his quest to win a second term in office. In President Yar'Adua's decision to return to the “Obasanjo Boys” who were responsible for his emergence to the national scene - is the reasoning that he never trusted the likes of James Ibori and Governor Bukola Saraki who he had surrounded himself with till date. As learnt, Yar'Adua believes that James Ibori and Bukola Saraki will oppose his candidacy come 2011. And for this reason, he has upped to reshuffle his cabinet and to let go the cabinet members loyal to James Ibori and Bukola Saraki. It is in this exercise of cabinet reshuffle, the President earmarked twelve  ministers to be removed and replaced. Interestingly, of the 12 ministers is the name of the Michael Aondoakaa - the current Minister of Justice and man-Friday for James Ibori. It is recalled that on Tuesday [November 17th 2009] Justice Aloysius Kastina-Alu was confirmed as the Chief Justice of Nigeria [CJN] in replacement of Justice Idris Kutigi - in a move deemed by insiders as the first step to the removal of Michael Aondoakaa. This is because both Aondoakaa and Katsina-Alu are from the same place – and typically, the rule of thumb dictates that the position of Minister of Justice and Chief Justice of Nigeria not to be from the same place. 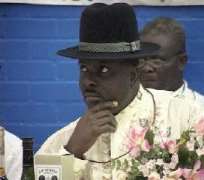 That notwithstanding, James Ibori who was said to have been unsettled by the move to remove his man-Friday from the office of the Minister of Justice was learnt by Ukpakareports.com to have stormed into the office of the president to rain insults and threats on the president. In James Ibori's rendition, he told President Yar'Adua that if he dares to remove Aondoakaa that he will blackmail him [Yar'Adua] out of office. It is unsure what President Yar'Adua's response was to the threat but it is believed that the President is determined to carry out his wish. In the same spirit, Yar'Adua has stepped to the Economic and Financial Crimes Commission [EFCC] to soft pedal on the former Chairman of the Commission in the person of Nuhu Ribadu. This, the President has asked the EFCC to do in the spirit of courting the “Obasanjo Boys” back into the Yar'Adua fold. Along the same line, the Chairman of the Peoples Democratic Party [PDP] is believed to be seating on a powder keg that has been slated to explode soon. Prince Ogbulafor, as learnt, may not be seated at the Chairman's seat by the time the 2011 presidential elections roll around.